The reactivity of a group of mouse Vα14+ NK T cell hybridomas was tested with a panel of analogs of the glycolipid α-galactosylceramide (α-GalCer). Interestingly, the nearly complete truncation of the acyl chain from 24 to 2 carbons does not significantly affect the mouse NK T cell response to glycolipid presented by either mouse CD1 (mCD1) or its human homolog CD1d (hCD1d). Therefore, we propose that only one of the two hydrophobic pockets of the CD1 Ag-binding groove needs to be filled by Ag. In terms of the sphingosine base, the mCD1 binding groove has less-demanding structural requirements for presentation to NK T cells than hCD1d. Tests of NK T cell reactivity to analogs presented by hCD1d demonstrates that the invariant TCRs expressed by mouse and human NK T cells are surprisingly similar in their requirements for glycolipid recognition. The CD1 proteins are cell surface glycoproteins that consist of a 43- to 49-kDa heavy chain noncovalently associated with β2-microglobulin (1). A number of properties distinguishes them from the MHC-encoded Ag-presenting molecules, including the ability to present lipoglycan Ag (2, 3, 4). Human CD1d (hCD1d)4 and its mouse homolog can present the lipoglycan α-galactosylceramide (α-GalCer) (5, 6, 7) to a subset of T lymphocytes called NK T cells. NK T cells in mice and humans differ from other T lymphocytes by a number of properties, including the expression of an invariant TCR α-chain (8) and specificity for CD1 molecules (9, 10, 11). Interestingly, although hCD1d and mouse CD1 (mCD1) share only ∼60% amino acid sequence identity in the Ag-binding region, the recognition of α-GalCer is conserved such that mouse and human NK T cells are highly cross-reactive (7). There is only limited information on the requirements for T cell recognition of lipoglycans, in terms of either the TCR V regions (6), the CD1 Ag-binding groove (12), or the structure of the Ag itself (4, 13). Here we have used a set of compounds related to α-GalCer, and mCD1 or hCD1d transfectants, to better define the biochemical basis for glycolipid Ag recognition by mouse and human NK T cells. The α- and β-GalCer, as well as various analogs of α-GalCer (structures and assigned numbers shown in Fig. 1⇓) were synthesized (14) by the Pharmaceutical Research Laboratories, Kirin Brewery (Gunma, Japan). Ag-containing solutions were stored in DMSO at −20°C and sonicated in an 80°C water bath before dilution into culture medium. B cell lymphoma A20 and HeLa cells were obtained from the American Type Culture Collection, Manassas, VA. hCD1d and mCD1 transfectants have been previously described (7, 15). The derivation and characterization of the mCD1 autoreactive T cell hybridomas has been described previously (6, 15). For the stimulation assays, 5 × 104 T hybridoma cells/well were cultured in the presence of 1 × 105 mCD1+, hCD1d+, or control stimulator cells. We used 100 ng/ml of Ag, an amount which was found to be near the optimal dose for stimulatory compounds. To block recognition of mCD1, the 1B1 anti-mCD1-specific mAb or an isotype-matched mAb were added to cultures at a final concentration of 20 μg/ml. To block recognition of hCD1d, the 51.1 anti-hCD1d-specific mAb, kindly provided by Dr. S. Porcelli (Brigham and Women’s Hospital, Boston, MA), or a control mouse IgG2b were added to cultures at a final concentration of 10 μg/ml. After 16 h, IL-2 release was evaluated in a sandwich ELISA using rat anti-mouse IL-2 mAbs (PharMingen, San Diego, CA). Total human PBMC were cultivated in 24-well plates in the presence of 50 U/ml IL-2 and 100 ng/ml Ag. Expansion of the Vα24+ cells was determined upon staining with a combination of anti-CD3, anti-CD4, anti-CD8, anti-Vα24, and anti-Vβ11 mAbs. Stimulation of the T cell lines was performed in flat-bottom 96-well plates. T cell lines were added at 5 × 104 cells/well, followed by 105 Ag-pulsed hCD1d transfectants, which were made by incubating cells for 2 h with 100 ng/ml of Ag followed by washing and irradiation. To block recognition of hCD1d, the 51.1 anti-hCD1d-specific mAb or an isotype-matched mAb were added to cultures at a final concentration of 20 μg/ml. Supernatants were quantified for IL-4 or IFN-γ by ELISA. We used a panel of α-GalCer analogs, described in Fig. 1⇑, to define the requirements for mCD1-mediated presentation. Working quantitatively with glycolipids presents a technical challenge due to insolubility. To some extent, this problem can be minimized by sonication and heating (O.N., unpublished observations). Furthermore, in most cases we used two different batches of the compounds, and we checked the integrity of the compounds by mass spectrometry. As negative controls, we used DMSO, in some cases ceramide, as well as β-GalCer. However, negative results with any compound must be interpreted with some caution because it is difficult to precisely gauge the amount of lipid Ag truly available for uptake and presentation. We have recently shown that mCD1 can present the α-GalCer molecule, 582, to a panel of mouse NK T cell hybridomas that have Vα14 paired with either Vβ8.2, Vβ7, or Vβ10 (6), whereas mCD1 autoreactive hybridomas with a different TCR α-chain do not respond. To assess the influence of the Vβ region on the specificity of the NK T cell response, we investigated the ability of mCD1 to present different α-GalCer analogs to these four Vα14+ T cell hybridomas. In agreement with previous results (6), some of the hybridomas exhibited a low level of reactivity to mCD1+ transfectants in the absence of Ag. Ceramide (not shown), β-GalCer (583), and two other analogs (see below) were unable to induce IL-2 release (Table I⇓). mCD1 transfected A20 cells pulsed with seven other analogs in most cases induced a response 10-fold above background by all four hybridomas, although generally 582 was most effective (Table I⇓). The mCD1 specificity of this response was confirmed by Ab inhibition (not shown) and the lack of presentation by untransfected A20 cells (Table I⇓). Because the responses by the four T cells to these compounds were similar, the data suggest that the differences between the β-chains expressed by these T cells do not make a significant contribution to the recognition of α-GalCer plus mCD1, although common β-chain amino acids could play a role. In contrast, the α-GalCer recognition by human NK T cells may be more dependent upon the TCR β-chain (L.B., unpublished observations). Several additional conclusions can be drawn from the data summarized in Table I⇑. First, and surprisingly, α-GalCer analogs with shortened acyl chains can be presented by mCD1. Indeed, α-GalCer analog 587 (C2 acyl chain length), elicited a strong mCD1-dependent response from the four hybridomas at a concentration as low as 10 ng/ml (Table I⇑ and data not shown). mCD1 has a hydrophobic Ag-binding groove with two large pockets called A′ and F′ (12). The two-carbon acyl chain of 587 is not long enough to significantly fill either pocket, although it might interact with mCD1 sufficiently to stabilize the structure. Therefore, these results suggest that only one of the pockets needs be filled by the Ag for efficient T cell stimulation. Interestingly, compound 591, which has a bulky aromatic group instead of the acyl chain, is not antigenic (Table I⇑). 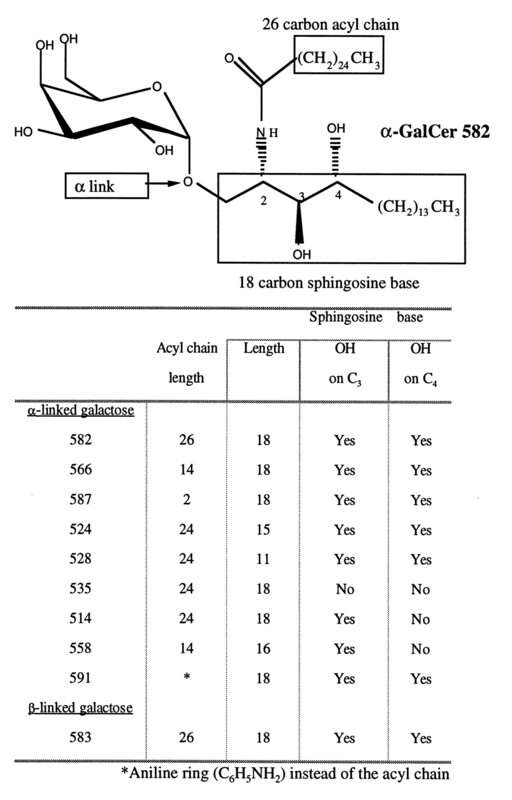 Second, the sphingosine base of the ceramide can also be shortened significantly because α-GalCer analog 524 (C15 sphingosine) and 528 (C11 sphingosine) are both stimulatory, although in some cases they were not as effective as α-GalCer analog 582 (C18 sphingosine). Third, the absence of the hydroxyl group in position 4 of the sphingosine in compounds 514 and 558 did not eliminate α-GalCer presentation by mCD1 (Table I⇑). Last, an α-GalCer analog (535) which lacks both hydroxyl groups found on carbons 3 and 4 of the sphingosine base cannot be presented by mCD1 to NK T cells (Table I⇑), subject to the caveat discussed above for nonstimulatory compounds. The data presented here are only in partial agreement with the results from a previous study (5), as it was reported that the 587 compound lacking the acyl chain was not antigenic. The discrepancies could be due to the particular Vβ8 CDR3 TCR expressed by the TCR transgenic mice used in that study, as these CDR3 regions are diverse in NK T cells. Because mouse and human NK T cells are highly cross-reactive, we tested the ability of hCD1d+ APC to present different α-GalCer analogs to the mouse T cell hybridoma 3C3 (Vβ8.2/Vα14) (Fig. 2⇓). Similar to the data obtained using mCD1+ APC, we found that the α-GalCer analog with a two-carbon acyl chain (587) can be presented by hCD1d (Fig. 2⇓A), whereas compound 591 cannot (Fig. 2⇓B). These results suggest that mCD1 and hCD1d could differ from hCD1b in the requirement for only a single acyl chain, because hCD1b cannot present a glucose monomycolate analog lacking the α-carbon branch (4). Structural requirements for α-GalCer Ag presentation by hCD1d to the mouse NK T cell hybridoma 3C3. hCD1d-transfected cells (A20 hCD1d), mCD1.1-transfected cells (A20 mCD1), or untransfected A20 cells were pulsed for 2 h with α-GalCer analogs or the vehicle control. Abs at 10 μg/ml were added immediately before the addition of the T cell hybridoma, and IL-2 release was determined by ELISA. The experiments shown here are representative of six independent experiments. Presentation by hCD1d may be more sensitive to the sphingosine chain length than mCD1-mediated presentation. Although both mCD1 and hCD1d can present the C18 sphingosine 582 and the C15 sphingosine 524 analogs to the hybridoma 3C3, in multiple experiments only mCD1 was able to present the C11 sphingosine analog 528 (Fig. 2⇑C and Table I⇑). We also investigated the importance of the hydroxyl groups on the sphingosine base for hCD1d-mediated Ag presentation. Data using compounds 514 and 558 demonstrates that, in contrast to mCD1, hCD1d presentation of α-GalCer requires the presence of the position 4 OH (Fig. 2⇑D). The presence of this hydroxyl group could be important for the interaction of some of the compounds with hCD1d but not with mCD1 molecules, as the same T cell was used in these experiments, although it remains possible that the hydroxyl is interacting with both CD1 and the TCR. 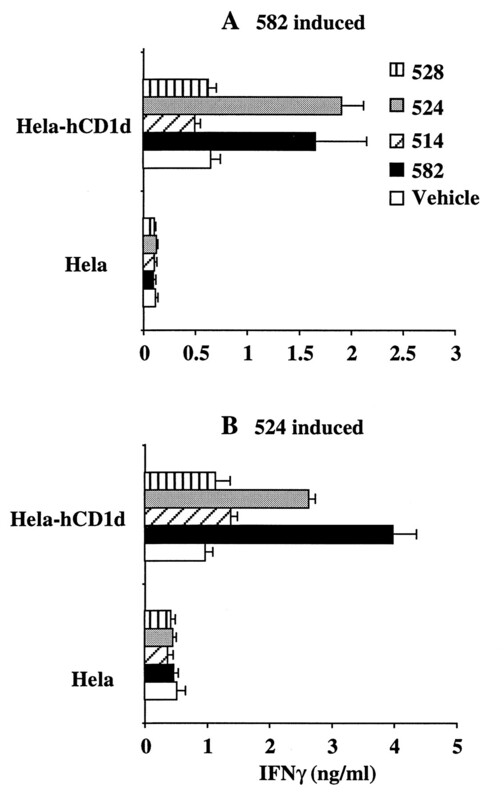 Similar to mCD1, the 535 analog that lacks both sphingosine hydroxyl groups cannot be presented by hCD1d to NK T cells (Fig. 2⇑B). We have recently shown that α-GalCer 582 can induce an hCD1d-dependent in vitro expansion of NK T cells from human PBL (7). To determine whether the results obtained with the mouse 3C3 T cell hybridoma might be representative of the human NK T cell population, we tested the ability of α-GalCer analogs to induce NK T cell expansion from fresh PBMC. Three different donors were tested, and the representative results from one are shown in Fig. 3⇓. Although Vα24/Vβ11+ T cells were barely detectable at the start of culture, similar to what we reported recently (7), the α-GalCer 582-positive control induced a 23-fold expansion in the percentage of NK T cells by day 11 (middle left). A 79% inhibition of the expansion of Vα24+ T cells was obtained for this line when cultures were set up from day 0 in the presence of the anti-Vα24 mAb (lower left). Analysis of the expansion induced by three other α-GalCer analogs correlates with the data obtained from the mouse hybridoma 3C3. α-GalCer 524 (C15 sphingosine) induced a 19-fold expansion in the percentage of NK T cells from the same donor (upper right), whereas α-GalCer 528 (C11 sphingosine) induced only a slight expansion (middle right). Finally we could not induce any expansion of Vα24/Vβ11+ T cells when the glycolipid 514 was added to fresh PBMC (lower right), confirming the requirement for the hydroxyl group at sphingosine position 4 for hCD1d-mediated Ag presentation. Human Vα24/Vβ11+ T cells from peripheral blood respond to α-GalCer analogs 582 and 524. We added 100 ng/ml of either α-GalCer analogs 582, 524, 528, 514, or the vehicle control, together with 50 U/ml of IL-2 directly to unfractionated fresh PBMC. The panels show the percentage of Vα24/Vβ11+ T cells as determined by flow cytometry at day 11. In the blocking experiment, 20 μg/ml of an anti-Vα24 mAb were added at the beginning of the culture. Representative of three different donors. A line raised in response to compound 582 and a line from the same donor raised in response to 524 were maintained in culture with two additional recalls using hCD1d+ APC pulsed with the original immunogen. This allowed enrichment of Vα24/Vβ11+ T cells to 17.6% for the 524-induced cell line and to 18.3% for the 582-stimulated line. Cytokine release assays were used to determine whether these two human cell lines were cross-reactive with other analogs. As shown in Fig. 4⇓A, the α-GalCer 582-induced line released IFN-γ in response to hCD1d+ APC pulsed with either the 582 or 524 compounds. A similar cross-reactivity was obtained with the 524-induced cell line (Fig. 4⇓B), and cytokine release could be inhibited by up to 80% by an anti-hCD1d mAb (data not shown). In contrast, responses to hCD1d+ APC above the autoreactive response to hCD1d could not be induced by either the 528- or 514-pulsed APC. Based upon these data, we conclude that compounds 528 and 514 are not effective at stimulating an hCD1d-mediated response by human NK T lymphocytes, when either naive or in vitro primed T cells are tested. 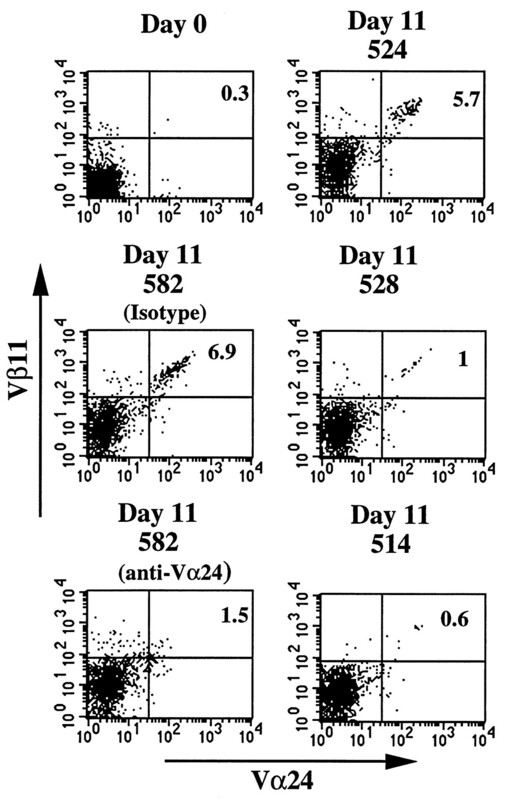 Cross-reactivity of human Vα24/Vβ11+ T cell lines from peripheral blood. 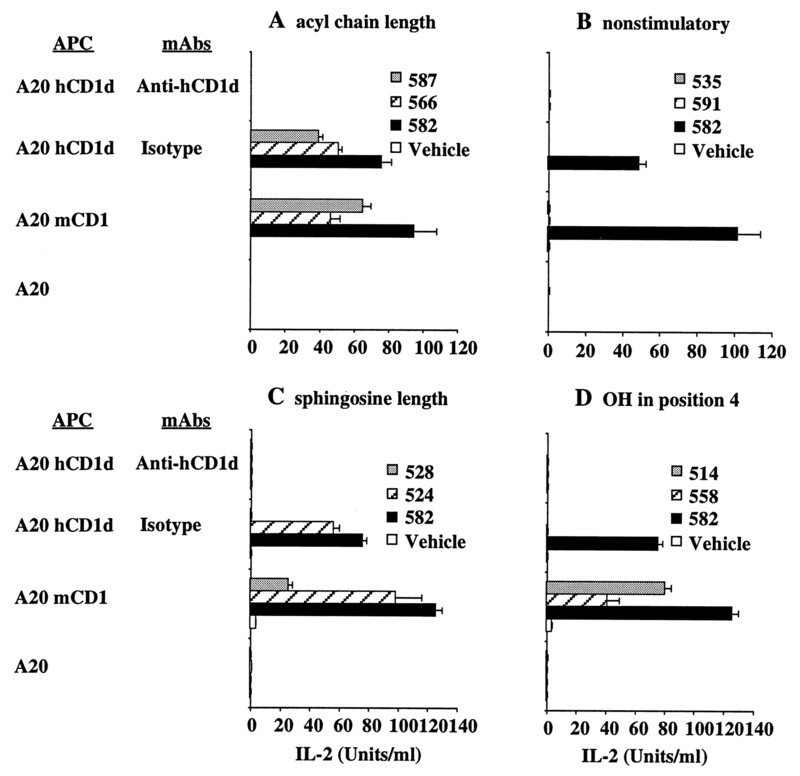 APCs pulsed with compounds as described above were incubated for 48 h with either a 582-induced T cell line (A) or a 524-induced T cell line (B). The data shown are representative of two independent experiments. In conclusion, we propose that only one of the two hydrophobic pockets of the CD1d Ag-binding groove needs to be filled by Ag and that the mCD1-binding groove has less demanding structural requirements for presentation to NK T cells than hCD1d. However, the interaction of mouse and human NK T cells with the different lipoglycans presented by CD1d molecules is conserved. We thank Drs. S. Cardell, M. Bix, and K. Hayakawa for kindly providing mCD1-restricted hybridomas. We thank Dr. S. Porcelli for providing the anti-hCD1d mAbs and Dr. Dellabona for providing the anti-Vα24 and Vβ11 mAbs. We also thank Drs. Yasuhiko Koezuka, Hiromi Nakamura, Massimo Degano, and Brian Bothner for helpful discussions and Gary Siuzdak for mass spectrometry analysis. ↵1 This work was supported by National Institutes of Health Research Grant CA52511 (to M.K.). This is manuscript No. 258 of the La Jolla Institute for Allergy and Immunology. ↵2 L.B. and O.N. made an equal contribution to this study. ↵4 Abbreviations used in this paper: hCD1d, human CD1d; mCD1, mouse CD1; GalCer, galactosylceramide. Brossay, L., M. Chioda, N. Burdin, Y. Koezuka, G. Casorati, P. Dellabona, and M. Kronenberg. 1998. CD1d mediated recognition of a α-Galactosylceramide by NK T cells is highly conserved through mammalian evolution. J. Exp. Med. In press.